I just want to tell you that your website is totally Greenie! My school has a club that we just started last year called the Backyard Greenies. We try to help the cause for nature and wildlife conservation. This is the year of the frog and to celebrate it we are painting a huge ceramic frog for our local zoo. 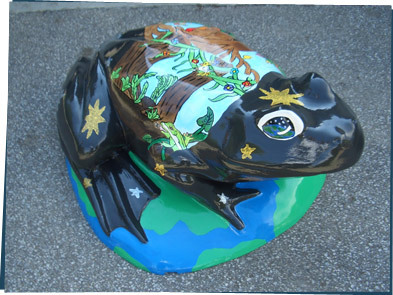 A total of 12 frogs will be placed throughout the zoo for viewers to look at and appreciate. We all love what you do and stand for. You, too Rachel. Thanks for sharing this! Are you doing something totally Greenie? Tell us about it!